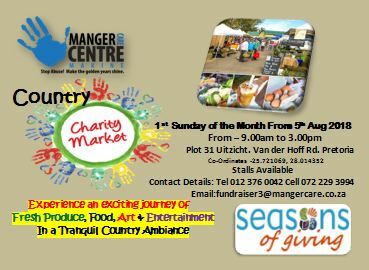 Manger Marine Care Centre will be launching the Charity Country Market with Food & Entertainment on 5 August 2018 and then every 1st Sunday of the month from 9am to 3pm. Family and Pet friendly. (No lions or tigers but tamed elephants with their own fruit will be considered) With a peaceful country ambiance, beautiful trees, abundance of bird life and spectacular panoramic views of the Magaliesberg makes this a tranquil and save environment for the whole family away from the hustle and bustle of the city life and kids can enjoy all the activities. Enjoy a delicious breakfast or lunch @ The Food Court with Live Entertainment from the variety of food stalls, while enjoying the variety of beverages on offer or a glass of wine. Barista’s will serve a wide variety of hot beverages for the coffee lovers. This market will underscore our Work Creation Projects from MCC Benoni and Future Sustainability for MCC. In addition to other exhibitors MCC will be exhibiting exciting products manufactured by our Carpentry Project, excellent craftsmanship in our Upholstery Department, freshly home baked bread and other home baked items from our renowned Bakery. Other Exciting Food, Boerewors Rolls, Pancake etc will also be done by the residents of MCC Marine Pretoria. In 1993, Manger Care Centre recognized the dire need of the elderly and disabled people. With this in mind, Manger Marine was established in Uitzicht on Van Der Hoff Rd (R514) between Pretoria & Hartbeespoort to cater for the elderly and special needs people. This is a very rewarding project. It is very clear that we are only scraping the surface and the need is growing faster than our capacity to assist. We recognized amongst the elderly a need to spend their golden years in a tranquil and safe environment. Our objective is to ensure the infrastructure and service is in place to enhance their lives. This market will take place on the property of MCC Marine which will allow the public the opportunity to visit our centre and experience firsthand the projects, interact with the residents and see what MCC needs are to cultivate a caring and loving environment that enables positive upliftment and empowerment for the people. Although the accommodation is humble, we like to keep it in good repair, clean and hygienic. Giving the residents a safe place, hot shower, and a comfortable bed and a good plate of food. There will be no stall fee, only a “blessing” (,but feel free to sow a seed) towards the centre. We will be marketing this market extensively with the printed media, radio, social media & networking. Giving the necessary exposure to draw the public’s attention to this worthy cause and getting the necessary feet and buying power. Establishing this market as exciting long term monthly event. All applications for a stall will be to the discretion of the market committee ensuring a unique market and quality products of a high standard. Plants, Seedlings & Fresh Flowers. Becoming involved with this exciting project as an exhibitor, visitor or donor you will directly be part of giving dignity, hope and honor to these persons. Should you wish to view the property please do not hesitate to make an appointment.